My spaghetti squash has plenty of flowers but is not producing any fruit. 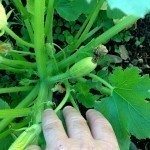 Zucchini is growing well but no spaghetti fruits. This could be pollination issue, effects of warm temperatures or watering issues. You could also have to hight of Nitrogen in the soil, which can cause lack of fruit. You could up the Phosphorous by adding Bone Meal. Here are some links for you to help you pinpoint the issue.